Just a girl with a hammer: A hail mary from the mystery willow! I decided the mystery willow is gone. The neighbors behind it moved down the street and rented out the house to their nephews who smoke constantly, play loud bad music, and generally make me feel 80 years old, and why can't they just keep it down so I can putter in my yard, for pete's sake? So I want to chop it down and plant something fast growing, evergreen, and DENSE. I succumbed to the Backyard Habitat rep's suggestion of a California wax myrtle. It grows really fast, it's evergreen, and it forms a nice privacy hedge. But the mystery willow said a hail mary! It produced fruit. The mystery willow is a pear tree! Goddamn it. I'm still going to chop it down. My inner 80 year old demands it. Wow, surprise pears! That's pretty cool. Also, here's to hedges! 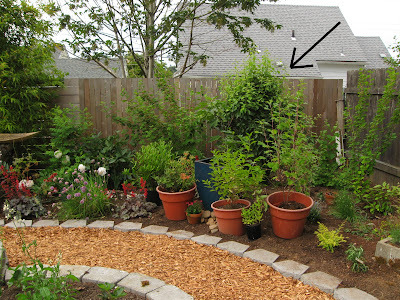 My barberry hedge is still growing slowly between us and the evil neighbors. Despite the small size of the hedge, the thorns are nice and pokey! Haha, yeah! Our hedge is dwarf barberry, so it's really short and not much of a deterrent yet. But regular-sized might be! You can have my barberry hedges. You know how much I hate them! Surprise pears are the best, really. Ha! You have no idea how happy it would make me to find the face of jesus in my pear tree--I could retire and just sell tickets to see it!